The most popular photo backdrop at the 30th Symposium on Fusion Technology (SOFT) in Giardini Naxos, Italy, sat just outside the conference building—the full-size prototype of a divertor cassette body. 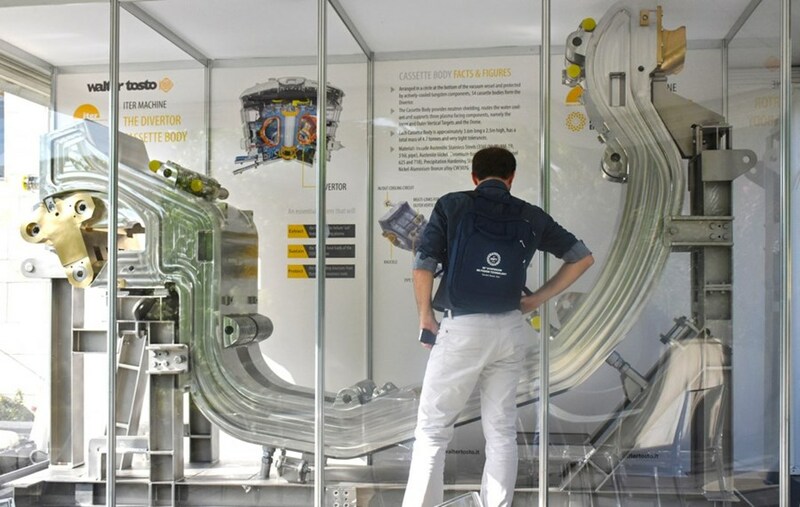 The divertor cassette body displayed at the 30th SOFT conference is a full-size prototype that—qualified as a spare part—could one day end up in the ITER machine as a replacement to one of the first-generation components. The divertor is located at the bottom of the vacuum vessel to extract ash and heat during full operation of the ITER machine. Each of the 54 divertor cassettes consists of a stainless steel support structure—as seen in the display—and three plasma-facing components: the inner and outer vertical targets and the dome. The divertor cassette body shown above was manufactured by the Italian company Walter Tosto for Fusion for Energy (F4E), the European Domestic Agency. The company was one of 35 companies to participate in this year's industry exhibition at SOFT, and the 4.7-tonne divertor cassette body was its calling card. According to Walter Tosto representative Massimiliano Tacconelli, the prototype could end up in the tokamak's vacuum vessel as it meets all ITER specifications and will be one of four spare cassette bodies.